HK2: The French Window in Hong Kong is Absolutely Sublime! Let me continue with my Hong Kong posts, which got derailed a bit (my apologies). I might as well jump straight to the best meal of the trip. Dinner at The French Window! We remember it fondly til today. Even hubby with his jaded palate was totally blown away. This might be our best meal of 2011 too, even though it's still early in the year. The Hong Kong Tourism Board (HKTB) hooked me up with The Miramar Group which has extensive F&B operations in Hong Kong. Little did I know we would be swept off our feet with this new gem on the haute cuisine scene. It's been around slightly less than a year, but press reviews have been glowing. 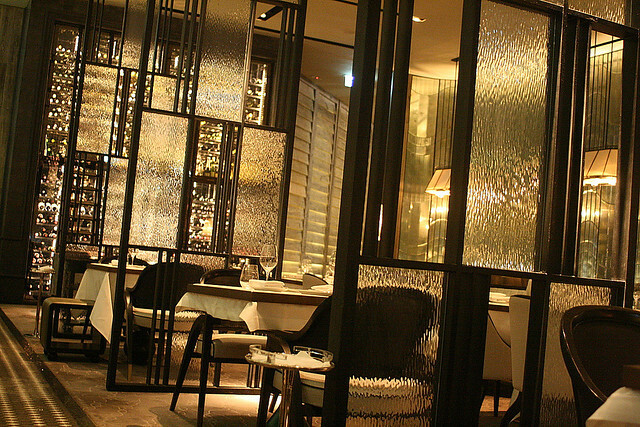 Firstly, there's the award-winning decor (The French Window beat 361 contenders to win New York’s Hospitality Design Magazine's “2010 Hospitality Design Awards – Fine Dining Category”). The entrance is deceptively simple. You enter a large, long and winding corridor clad with weatherbeaten blue-gray boards and shuttered louvres reminiscent of a rustic French chateau. The way is studded with beautifully curated plant displays. The wine fridges you pass offer you a glimpse of the collection they house. 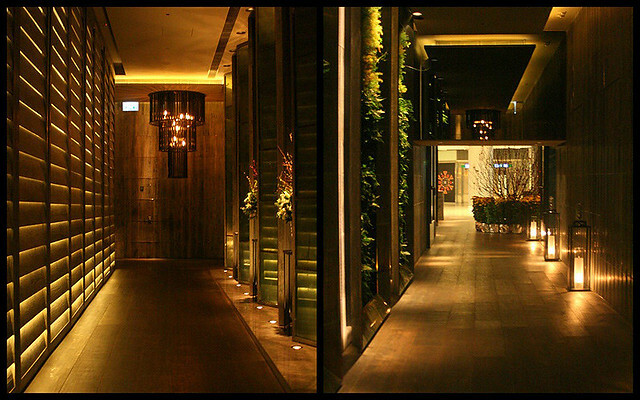 The restaurant is located at the ifc mega-mall, but these walkways will transport you to another world. You will soon forget you are even in a bustling shopping complex. The main dining area is an elegant setting of glass, metal and art deco motifs. There are black and white chairs, as well as plush sofa seating along the wall. The whole place is quietly imposing and yet warmly welcoming at the same time. At night, it is breath-takingly romantic (but that also means very challenging lighting for photography!). The staff here are very well-trained, and not only see to your needs swiftly but also sometimes anticipate them before you even ask for it. 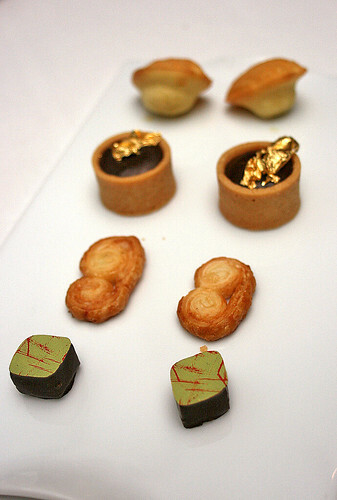 Chef Stéphane Haissant joined The French Window as their Master Chef in the beginning of 2011. Haissant has had stints at La Tour d’Argent and worked under Michel Guérard at Les Prés d'Eugénie and with Alain Senderens at Lucas Carton. 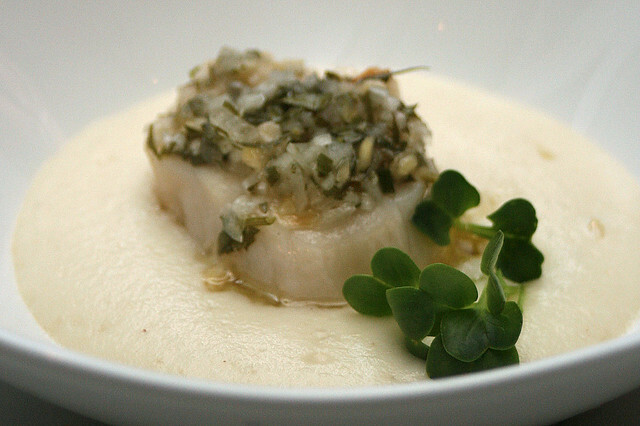 Here, his brand of nouvelle cuisine celebrates natural flavours in bold and playful ways. We chose the six course degustation menu (about HK$800). 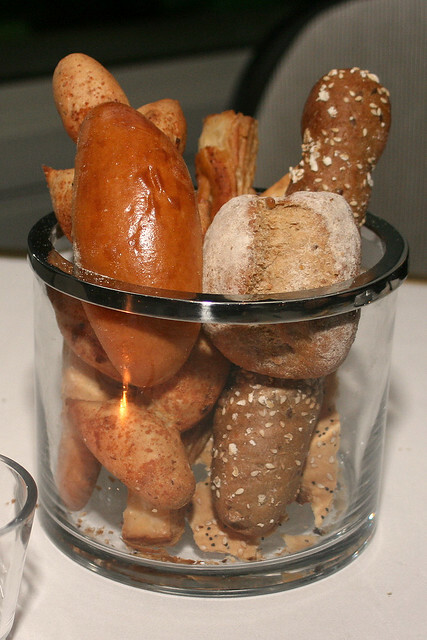 The welcome bread basket is this luxurious glass jar of artisan breads - some of the best I've had in a long time. And they happily replenished this too! 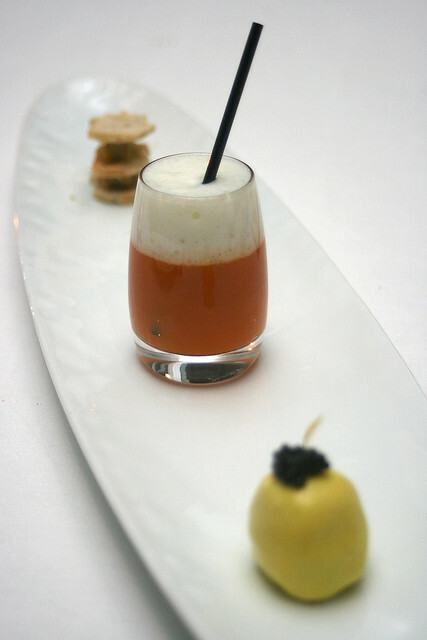 Amuse bouche - not one, but three items! Curried salmon sphere and harenga caviar (foreground, and right): I really loved this. It's like a quail's egg made of salmon, with just a hint of curry. The caviar brought it all together. Carrot and ginger soup (middle): very light and just gently savoury. 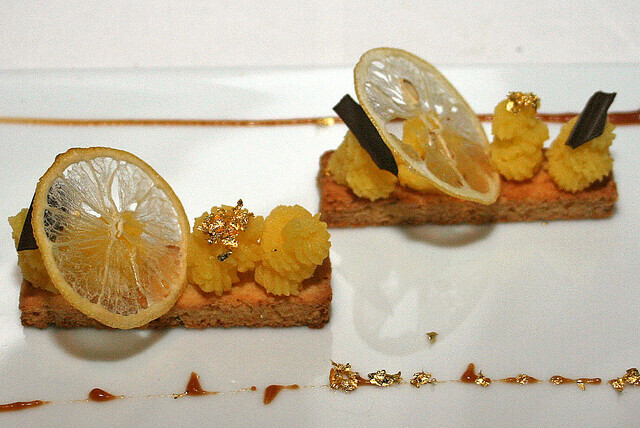 Foie gras toast (back): oh what a decadent morsel that made us want more. 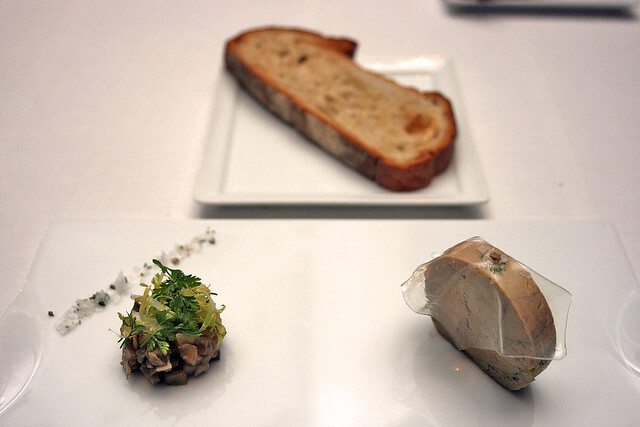 And yes, there would be more foie gras coming up! The foie gras here is positively divine! Hubby who normally hates foie gras actually enjoyed this and polished every bit. Trust me, that is some serious endorsement, folks! The veil of gel (maybe it's collagen jelly) almost makes it look like a bride. The sour mushroom compote helped to balance flavours and cleanse the palate. This was one large scallop, and it was still firm and cooked just right. The smoked artichoke was very gentle, flavourwise, and so did not overpower the scallop. This was our unanimous favourite. The fish was grilled to perfection. It was so delicious. But the real eye-opening surprise lay in the zucchini risotto. As I played with it in my mouth, I wondered if there was actually any rice in it. It felt like there were rice-sized grains, but each of these had a turgid crunch and sweetness that rice could never yield. True enough, the maitre'd told us they used purely zucchini to simulate rice. 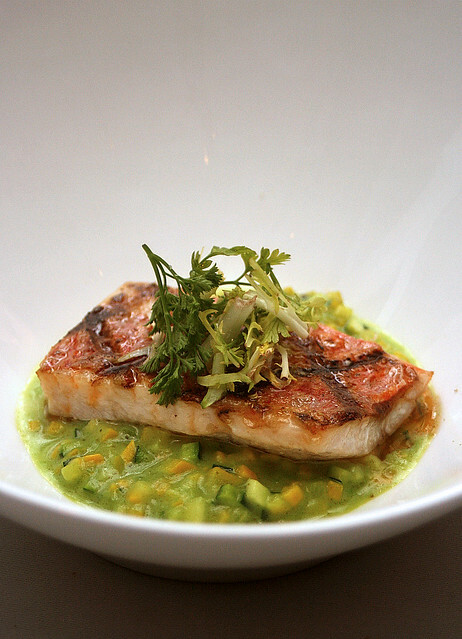 It's all cut into rice-like grains, and cooked in a gorgeous savoury puree. Phenomenal! The chef is quite famous for his grilled pigeon. He combines traditional and new methods to bring about a fresh take on this French dish. 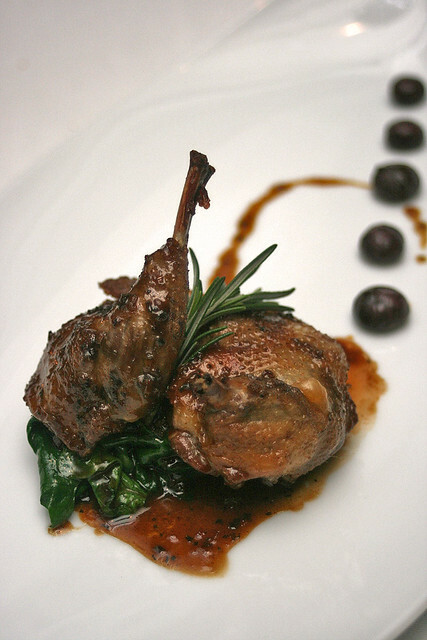 The tender, smoky pigeon absorbs the fatty rich flavours of foie gras, and the meaty aroma of mushrooms. And he does not stint on portions. This was very filling! Now, thyme jelly. 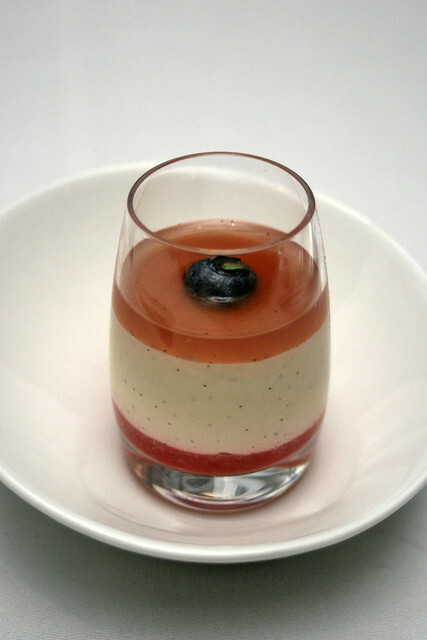 If you were as unsure as I was about a herb-flavoured jelly in a dessert, you'll be as pleasantly thrilled and amazed at how well it works! In fact, it was the element that heightened the otherwise standard combination of vanilla and strawberry to a different class. Thyme jelly! Who would have thought! More dessert? A wet one and a dry one, why not. I love the crackling thin slices of candied lemon. Dip the sable biscuit onto the sea salt caramel piping on either side, and enjoy. 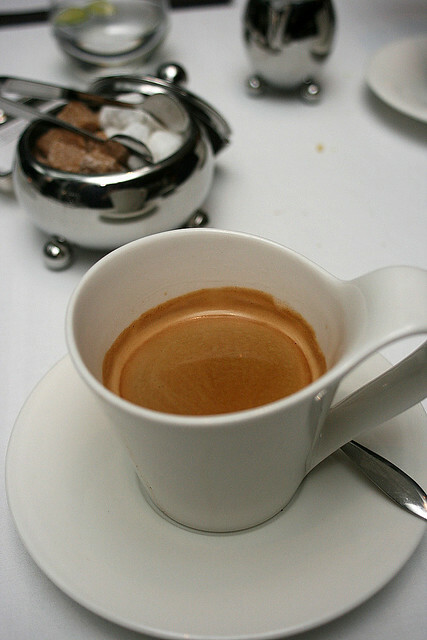 The perfect way to round off such an amazing meal is with fabulous coffee that's truly robust and aromatic. This felt great in the winter month. Coffee was served with petits fours, which included some stellar chocolate, but we were really struggling at this point in time. I never thought I could be so full at a French fine-dining restaurant. 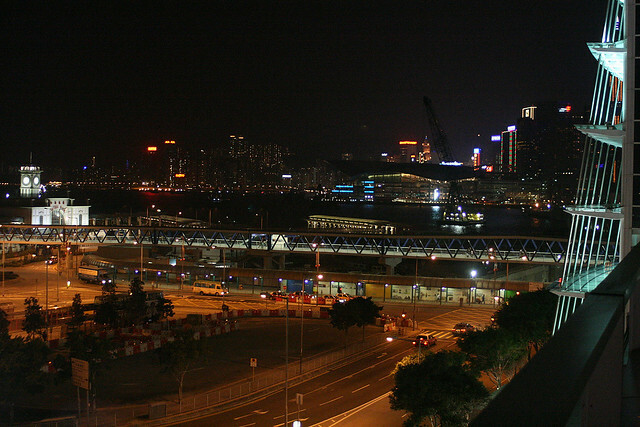 The harbour view from ifc forms a spectacular backdrop to your meal (this view is taken from a balcony, as the floor-to-ceiling glass window was a bit too reflective for photography). The French Window also looks beautiful in the daytime in a different way (you can check out the website for photos). We hit upon the idea of taking the ferry (instead of the MTR) back to Tsimshatsui where we were staying. It was a gorgeous way to end the evening. We really enjoyed our three-hour meal here, and we can't wait to come back. Our most heartfelt thanks to the Miramar Group (a great pleasure meeting Connie) for hosting us, and to Vivien of HKTB for making this happen. Sun/public holidays 11.30am-3.30pm & 6pm-10.30pm. Your photos are amazing, the food looks so good! Too bad this is in HK and not in Singapore or I would really love to try it out! Agree with the reader above on your photos. What camera do you use, if I may ask. Ros: Thank you too! My photography barely does the food justice (it was so so so so good!!!!). How I wish I could transfer the taste digitally too! I'm using a Canon 400D with kit lens. It's an old camera, but very reliable so far.